New Multi-flex Variable-shape Conveyor is Industry's Fastest to Reconfigure, Most Versatile. 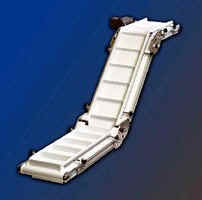 July 2006 - Conveyor Technologies' new Multi-Flex VSC conveyor system brings the greatest flexibility in assembly/changeover ease to low-profile angle conveyors. The VSC (variable-shape conveyor) system's three different angle selections - 30°, 45° and 60° - can be assembled into eight different conveyor types to transfer product between different elevation patterns. Discharge height can be altered with a 7.5° adjustable tilt discharge frame section. Providing fastest assembly and reconfiguration to changing needs, the system combines industry's quickest endless belt removal and tension/tracking system with rapid, accurate belt calibration. Frame sections permit random repositioning, and drive and tail pulley location can be reversed to meet changing needs. Engineered for high uptime, the Multi-Flex VSC provides positive automatic tracking through transition zones with self-cleaning, virtually wear-free vee guide. Proven durable and highly reliable, Conveyor Technologies' automatic belt tracking system prevents mistracking and belt damage during changes from horizontal to incline or decline. Steel transition plates, .31" (7.8 mm) thick, maintain rigid alignment for stable belt control. High-lateral-stiffness belting reduces deformation, permitting higher load capacity, while offering improved belt and cleat life. Clean engineering prevents lubricant contamination of belt or product. The robust design is backed by industry-best two-year warranty, including bearings. The system is available in both rigid-side and flex-side styles. Rigid sides give greater effective load width, up to 21.5" (546 mm). Flex side units for particulate material are available in five widths from 2.88" (73.15 mm) to 19.38" (492.25 mm). S-style frame rails are standard with dual Tee-Slot Rails available as an option. Load capacity varies with type, width and angle. Capacity of a typical Type HIH, 12" (304.8) mm) wide at 45°, is 200 lb (90.9 kg). The Multi-Flex conveyor is part of a patented, modular product concept that is foundation to 15 different low-profile conveyor types from Conveyor Technologies. The modular system allows great interchangeability of components, and is available in U.S. or metric versions.